This beautiful combination of pink and purple flowers will show that they will be forever cherished. Forever Cherished Trio includes a casket spray, standing easel spray and crescent urn arrangement. Red and white casket spray, urn and wreath fit for a royal tribute. Red roses and premium foliage combine to make this elegant tribute. The Royal Rose Trio collection includes a casket spray with two complimenting urns. Simple beautiful pink combination of Roses, Carnations and Snapdragons. 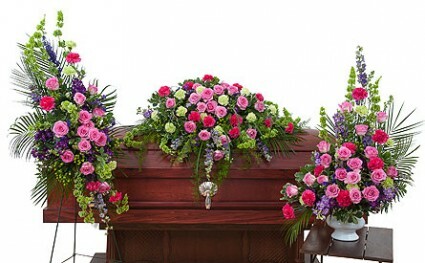 The Peaceful Pink Trio includes the casket spray, a large urn and a small urn.